His name may be the Irish Wolfhound Dog, but this canine is absolutely no wolf in sheep's clothing. Learn more about this congenial and tallest of all dog breeds. 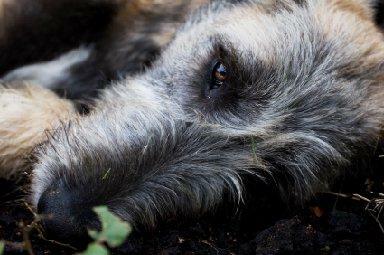 As its name implies, the Irish Wolfhound Dog is a product of the Emerald Isle. In the breed's first incarnation, these dogs were used in warfare by the Celts to attack Roman riders during battle. The breed was bred for size, fierceness and loyalty to its masters, and was said to strike terror into the hearts of any opponent it turned its eyes upon. In addition to their use in warfare, the Celts also used these enormous dogs as hunters in the field, mainly when pursuing wolves and wild boars. In fact, the pursuit of wolves is what gave the breed its identity and name. They were so adept at hunting their canine ancestors that they literally wiped out wolves in Ireland. The breed created such fascination they were deemed only fit for royalty, and as such, many of these dogs were exported to other kingdoms as gifts of state. At one point, the breed was depleted to near extinction; they might have disappeared if not for the efforts of one Captain Graham. Captain Graham, lacking a viable breeding population, began breeding some of the remaining Irish Wolfhounds with other dog breeds such as the Borzoi, Great Dane and Scottish Deerhound. Gradually, the Irish Wolfhound was repopulated, but it now looked different due to the influence of the breeds used to sustain it. The Irish Wolfhound Dog as we know it today is quite a different creature from the one that terrorized the Romans so many centuries ago. Today's Wolfhound is far more likely to be a cherished family companion that loves to accompany his special people on a cross country hike or the occasional hunt. Although not technically the largest dog breed, the Irish Wolfhound Dog does carry the distinction of being the tallest. Coats are rough and extra wiry over the eyes and muzzle. Dogs of this breed are fondly referred to as "gentle giants" and that should tell you something about their character. They are very loving and loyal to their families, but protective around outsiders who haven't been properly introduced. This makes them exceptionally good companions for children. There's an old adage about Wolfhounds being gentle when they're stroked, but fierce when they're provoked. That sums them up fairly well. 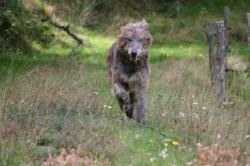 As with so many giant breeds, the Irish Wolfhound has a relatively short life span, averaging about six to eight years. Of course, there are individuals who defy the odds and live as long as ten years, but they are in the minority. Many of this breed's health issues hinge on its growth cycle. The Wolfhound tends to grow quite rapidly as a pup, giving it the appearance of maturity long before it truly reaches that level. For this reason, it is important to treat Irish pups as puppies until they are about eighteen months old. These dogs should be kept on puppy kibble formulated specifically for large breeds for the first eighteen months of life. This will help assure they receive adequate nutrition to help their framework grow strong, but not allow them to gain weight too rapidly. Excess weight on new bone growth puts too much stress on the joints, leading to problems with arthritis and hip and elbow dysplasia later on. At eighteen months, you can begin switching over to an adult diet, but stay with a mix meant for large breeds. Providing the proper nutrition for your Irish is just one step in giving him the best chance of enjoying good health. Don't let his size fool you, a puppy that has reached its full height is not necessarily ready for the type of running that is involved in coursing and hunting. Start your pup too soon, and joint damage will surely follow. In addition to health issues connected to growth, the breed is also prone to some congenital health problems. Gastric torsion: Also known as bloat, this condition causes a painful twisting of the stomach, closing off the entrance and exit. This traps the gastric juices inside, and the situation cannot resolve itself without surgical intervention. Once a dog bloats, it is prone to bloating again, and although the stomach can be tacked in place, the stitches have been known to tear free in proceeding incidents. Dilated cardiomyopathy: This condition is commonly referred to as an enlargement of the heart, caused by overwork; not necessarily a surprise considering the Irish Wolfhound's great size. Once enlarged, the heart is no longer able to pump efficiently, and eventually becomes completely worn out. Liver shunt disease: This is a congenital condition where the circulatory system bypasses the liver by way of a blood vessel. Without proper blood filtration, affected dogs usually begin showing signs by six months of age. Symptoms can include weight loss, kidney stones and seizures. Bone cancer: Malignant boney tumors form in the soft connective tissues between the bones, weakening them and causing pain. Eventually the cancer cells migrate to other areas of the body, causing death.